Fall has arrived at the mountain. Leaves have turned. The evenings have become brisk, and the crowds have begun to thin. 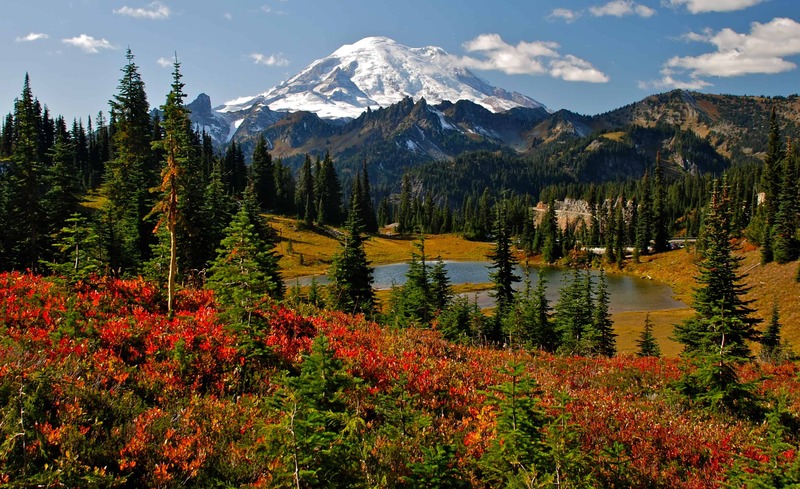 Autumn at Mount Rainier; it’s simply a stunning time to visit the park. Come for a fall getaway this season. US Forest Service Road 73 to US Forest Road 75 is a nice loop trip ending back on Highway 410. US Forest Service Road 70 off Highway 410, just outside Greenwater, offers a scenic nine-mile drive up to Greenwater Lake. 2.6 miles, RT – Expect brilliant fall color from Huckleberry and ash in expansive meadows; easy hike for families off Stevens Canyon Road. Free mushroom picking permits are issued by the US Forest Service. Harvest area maps are available at US Forest Service offices in Enumclaw and Randle. Gatherers along Highway 410 outside Greenwater are encouraged to park along the highway and explore along valley bottoms. Mushrooms will start popping up as weather dampens. For more information contact the US Forest Service Enumclaw station: 360-825-6585 and the US Forest Service Randle station: 360-497-1100. Huckleberry picking is free and no permits are required! Good spots are up above 3,000 feet…example: along Pacific Crest Trail. According to Forest Service employees, there are still some berries up there, but that can change as quickly as the weather changes. This is the season for great lodging deals all around Mt. Rainier. Score yourself a deal on your next stay at the mountain. Find information on these specials and others, here. Visit Rainier is a not-for-profit, non-membership destination marketing organization that promotes tourism in the gateway communities around Mt. Rainier. For more information on visiting the Mount Rainier area this fall download a copy of the new free vacation planners.